There’s no denying that stocks have been highly volatile recently, with the S&P 500 suffering its worst December since 1931 followed by the strongest January in 32 years. But what investors need to know is whether either of these drastic price changes (or both) were justified by fundamentals or merely the result of the market’s amazing power to be infinitely stupid in the short-term. That’s especially true now, given that in recent weeks earnings growth forecasts have plunged meaning that the recent rally might prove unsustainable and about to give way to another major sell-off. So let’s take a look at why analysts have become increasingly pessimistic about 2019’s earnings growth, but more importantly whether that pessimism is a reason for you to make significant changes to your portfolio. 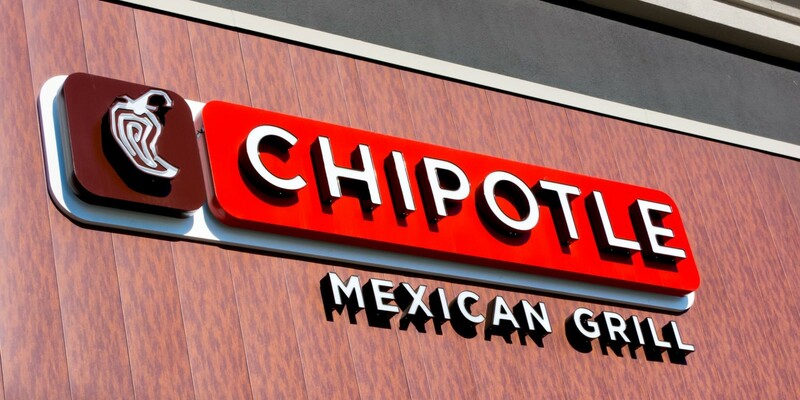 Stock prices are ultimately a function of earnings so it’s important to watch these fundamentals closely because they affect the intrinsic value of the company’s investors own. 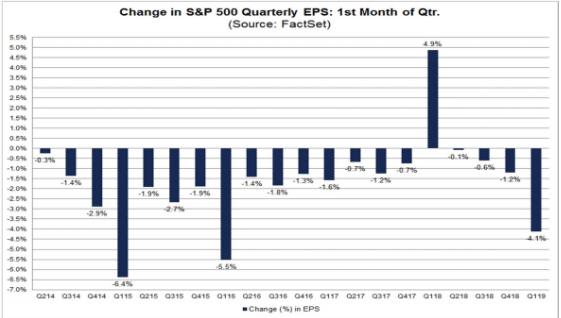 So far Q4 2018’s earnings season has been strong, with FactSet Research reporting that 70% of companies have reported beating their earnings expectations and 62% top lines sales estimates. Both figures are in line with the S&P 500’s five-year average beat rates. 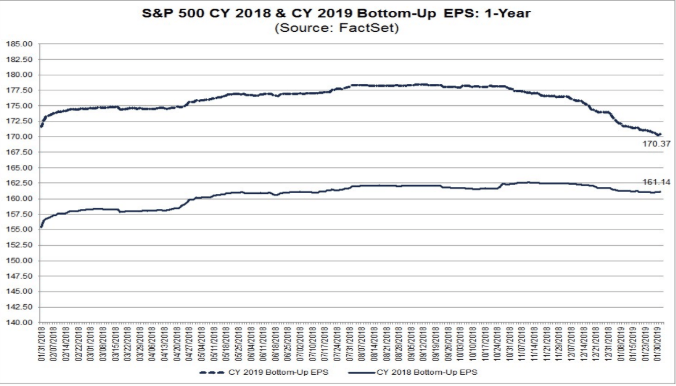 With 46% of companies having reported so far (another 20% reporting this week), we’re on track for 12.2% EPS growth so far, which would be the fifth straight quarter of double-digit earnings growth. But what understandably has investors nervous isn’t strong growth in Q4 of 2018 (a year that benefits from a 14% decrease in the corporate tax rate), but what 2019 will bring. After all, this year companies will have a high hurdle to clear thanks to about 20% EPS growth in 2018 plus a number of big headwinds including slowing US and global growth plus the US/China trade war that has already hammered some major corporate giants like Apple. 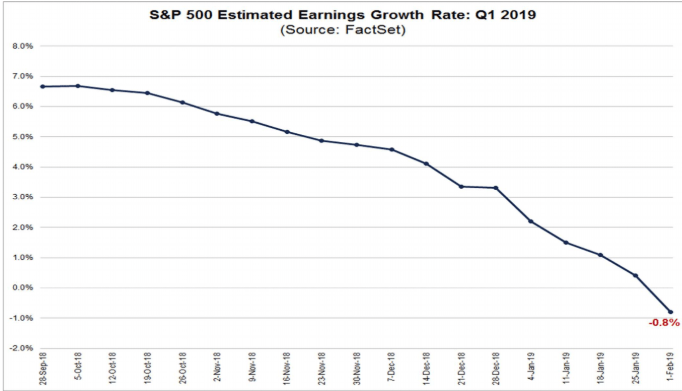 For Q1 earnings growth forecasts have plunged, with the consensus estimate falling by 4.1% in January alone (biggest first-month decline in nearly three years). That means that analysts are now expecting the first YOY earnings contraction for corporate American in nearly three years (since Q2 2016 which was a result of the oil crash crushing the energy sector’s profits). Perhaps more troubling is not just that earnings expectations are falling but what sectors are expected to be hit the hardest. Those include technology as well as communications (which now include both telecoms like AT&T but also Wall Street darlings like Alphabet and Facebook). Given that those two sectors alone make up 25.5% of the S&P 500 (and consumer discretionary, energy and materials another 20%) this means that about 45% of S&P 500’s market cap is expected to report negative growth in Q1. If that proves true then stocks might indeed be in for a sharp downturn in the coming months. Worse still for the full year EPS growth expectations have similarly been falling, down to just 5.6% for this year, compared to 10.5% in July. And if analysts are right then the first nine months of this year will see virtually no bottom line growth and significant margin compression. Yet because of the strong January rally, the market’s forward PE ratio is up to 15.7, basically in line with its 20 year average of 16.0. In other words, while analysts are warning of deteriorating corporate fundamentals (profitability and earnings) stocks have gone from undervalued to basically fairly valued, and that’s only if expectations don’t fall much further. So does this mean that the January rally was a “bear trap”? Are stocks now poised for a major spill that will once more see rapid and huge declines like in December? To answer that question let’s look at the reasons that expectations are falling so quickly, and how likely those negative headwinds are to continue as the year progresses. 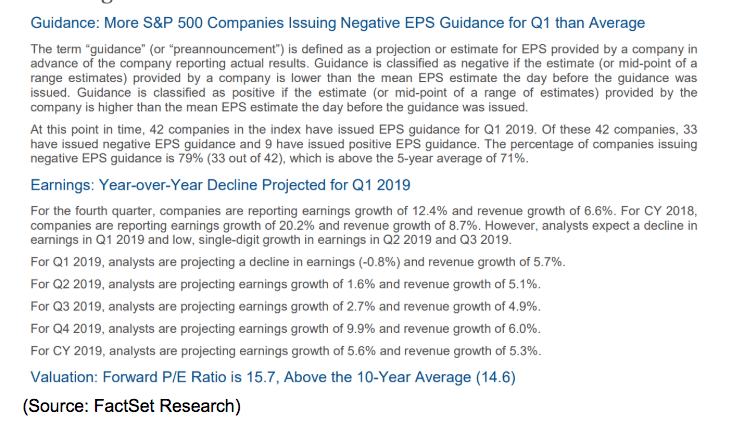 The first reason that analysts are slashing 2019’s growth estimates is due to negative guidance from companies. 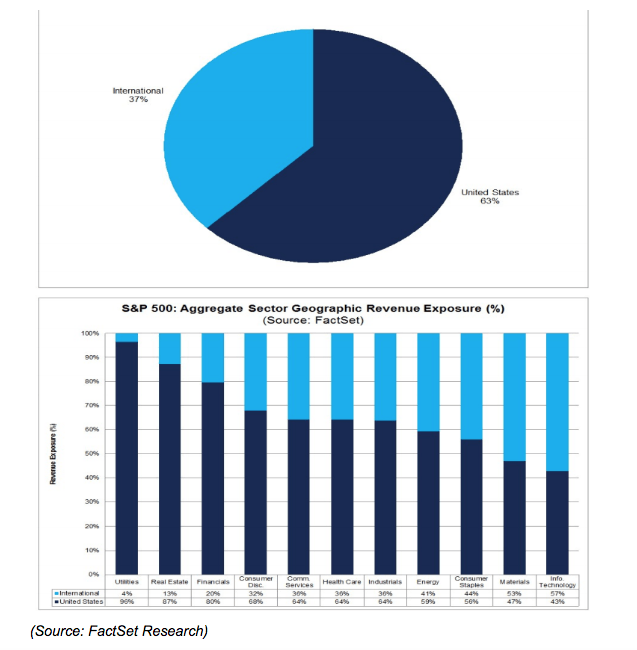 Thus far 18% of companies that have reported Q4 results have issued guidance for Q1 and of those 79% have issued negative guidance. Now it’s important to remember that companies love to beat guidance which is why over the past five years 71% of guidance has been negative. So while 79% negative outlooks is high, it’s not that much more than what we typically see. Why are so many companies issuing negative outlooks (and possibly sandbagging results so they can “beat” lower expectations)? Well, the trade war is certainly a big contributor to that. You can see that of the companies that derive the most revenues from overseas, which happen to also be the sectors with the most negative earnings growth outlook for Q1. But we can’t forget that energy stocks, including oil companies, are going to have to deal with the 45% oil crash that occurred between October and December. Oil prices have recovered about 30% since the December lows, but are still below the levels of Q1 2018. But besides negative guidance (that just 14% of reporting companies have thus far issued), there is another reason that analysts are likely being so bearish right now. Sell-side analysts, who work for the major banks and asset managers, want to please companies and one way of doing that is steadily lowering expectations ahead of actual earnings reports. This is why in the past 20 quarters analysts have only raised their forecasts once, and that was in Q1 2018 when tax reform made it impossible to do otherwise. Now it’s certainly true that January’s 4.1% is much higher than the 15-year average first month of the quarter’s 1.7% forecast decline. This is likely partially due to rising pessimism about global growth (especially China’s economy, which continues to deteriorate faster than expected) and worries over tariffs hurting margins due to higher input costs and supply chain disruption. 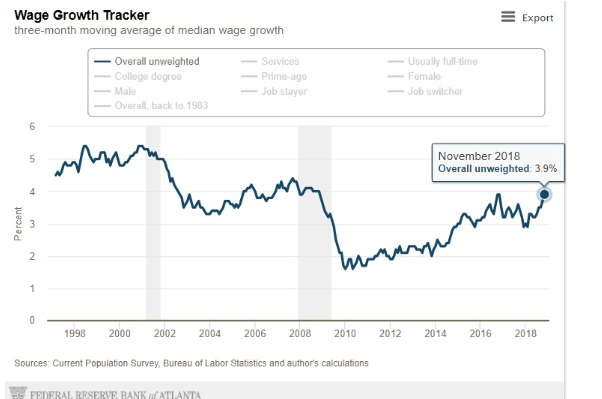 And we can’t forget that the strongest US labor market in decades has caused wage growth to accelerate at a rapid pace in recent months. Note that due to the government shutdown the Atlanta Fed’s median wage growth tracker is running two months behind. Based on the average wage growth data of those months (steady increases) median wage growth is now very likely above 4%. Rising wages are going to temporarily squeeze margins until companies adapt by investing in productivity-boosting capex. The point is that analysts, like all of us regular people, are prone to periods of excessive optimism and pessimism. Thus they are likely overshooting to the downside on earnings forecasts, particularly since doing so will make it much easier for the companies they cover to then beat very low expectations (which makes Wall Street banking clients very happy). But the biggest reason I’m not personally worried about 2019’s earnings growth is because of the good trade news we’re getting. I’m not just talking about China already backing off some retaliatory tariffs they imposed last year (US auto tariffs reduced from 45% to 20%), or the offer to increase US imports by over $1 trillion Beijing made in early January. Those are all positive signs that China’s bleeding manufacturing sector (which is now in an accelerating recession) has China eager to cut a deal. But Bloomberg is reporting that White House staffers tell it that Trump is also eager to declare a major victory, both for the boost to stocks that would entail, plus the need for “the greatest trade deal in history” to run on in 2020. Last week China’s Vice Premier met with US trade Rep Robert Lighthizer (who is leading the negotiation on the US side) and invited Trump to meet with China’s President Xi in February to discuss the trade dispute. Sources are telling both US and Chinese media outlets that at the De Nang, Vietnam summit on Feb 27th and 28th (over North Korea’s nuke program), Trump and Xi will meet to hopefully finalize a trade deal. Or at the very least they’ll extend the March 1st deadline when tariffs on $200 billion in Chinese imports are set to rise from 10% to 25%. Currently, most analysts and economists expect such an extension to occur with some even predicting that a partial deal will be reached. That would see China start importing more US goods immediately, with the US reducing tariffs on its imports while negotiations continue (on IP protect, non-tariff trade barriers, and China’s 2025 industrial growth initiative). But it’s not just economists and analysts who are confident that a deal is coming this month. In other words, the risks of the worst case scenario, of trade talks collapsing and the US imposing 25% tariffs on all of China’s imports within the next few months, appears to be falling by the week. Ultimately with the trade war being such a large reason for China’s economic slowdown in recent months, as well as a major reason that corporate earnings expectations have been declining, a major breakthrough on trade is a powerful short-term catalyst that could reverse falling earnings growth expectations in a hurry. Not to mention send the stock market up by a potentially significant amount. 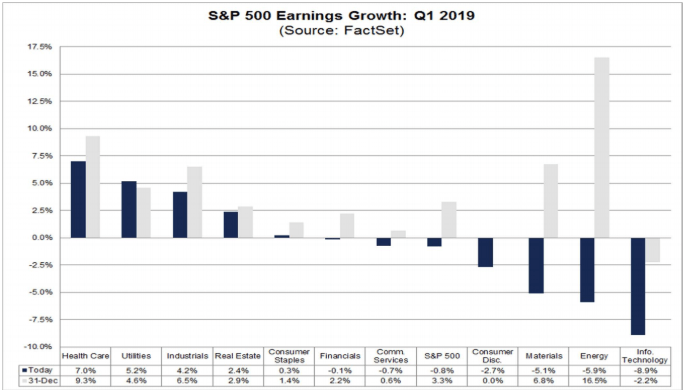 Because remember that those same analysts that are currently so bearish on 2019’s earnings growth are also expecting growth to accelerate as the year progresses, and spike sharply in Q4 2019. The reason for that is likely the final resolution of the trade war, which has been hurting both economies and which it is now clear that both sides want to end as soon as possible. While seeing such a drastic reduction in earnings growth forecasts is understandably frightening, investors have to remember that analysts nearly always steadily reduce expectations as a quarter progresses. Since they work for Wall Street banks that do businesses with companies, it’s in their best interest to keep their clients happy and their clients like to have low bars to clear so they can “beat” on the top and bottom line. Now it’s certainly true that the trade war is negatively impacting the economies of the US and China, both of which are slowing (and dragging down much of the world with us). But the good news is that both sides are working hard at finalizing a trade deal that will not just end the tariffs that went into effect last year but also likely see China greatly increase imports from the US. That means that the very catalyst that has many corporations now warning of a weak 2019 could reverse relatively soon, and turn into a powerful growth boost in late 2019 and 2020. And with the US economy continuing to fundamentally remain healthy, including accelerating job growth and rising wages despite all the risks we’re facing, now is a great time to not just stay invested but potentially buy 10 stocks that are likely to do especially well in the next few months, and the rest of the year as well.